Lightweight wire wheels for models are simply difficult to find. Peter Rake came up with a method that could be cut on the laser and assembled on a simple jig. When assembled these wheels are approximately 4-1/2" diameter. 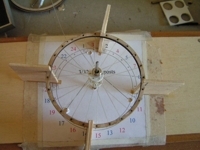 The wheel rim consists of layers of birch ply. The inner layers have holes drilled for the 'wire'. The 'wire' is 8lb test monofilament fishing line (not furnished) and is suitable for models weighing up to 4 pounds. The tire material is 1/2" smooth neoprene cord. The kit includes pre-drilled plywood rims, pre-drilled fiberglass hubs, 1/2" neoprene cord tire material, and rudimentary instructions with a "wiring diagram". (Sorry for the poor instructions, but it's all we have...) The builder will need to furnish 5/32" and 1/8" brass tubing, and Kevlar thread or Berkley Whiplash super braid big game fishing line.